Nxamaseri Island Lodge is renowned for its incredible year-round fishing and is featured in several specialist books including “Fly Fishing in Southern Africa”, “The Longest Cast” and “A Fly Fishing Safari in Africa”. 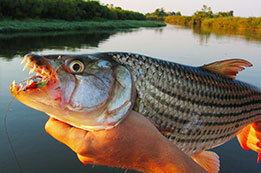 The Tiger Fish is an indigenous species that provides thrilling angling for both experienced and novice fishermen. It has a voracious appetite and can reach as much as nine kilos in weight. 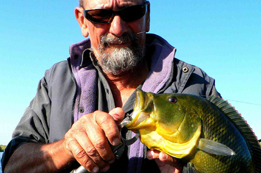 Bream fishing is usually best during the winter months, from April until August. 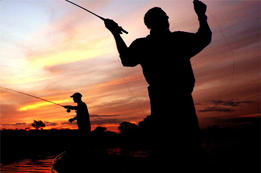 The optimum time to fish for Tiger Fish is during the annual catfish runs (“barbel runs”). The exact time of these runs differs from year to year but generally lasts from late August to the beginning of November. Outside of these months Nxamaseri Island Lodge is still able to offer excellent fishing as the water levels are lower. This concentrates the marine life in the permanent channels and you will experience a great deal of species diversity. Nxamaseri Island Lodge offers a number of specialist fly-fishing guides and fully equipped boats. 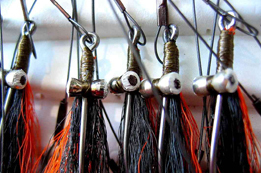 We can also make special arrangements if additional boats are required for fly-fishing. We carry standard lure and basic fly fishing equipment, but suggest that avid fly-fishermen bring their own equipment.